What do you find affirming or disturbing (or both) about this? I was reading this morning in Luke 12 where Jesus says "Be on your guard against the yeast of the Pharisees, which is sheer pretense." He is speaking in that part of Luke about the importance of a faith that is the same on the inside as what we display on the outside. This photo illustrates the performance side of modern worship. 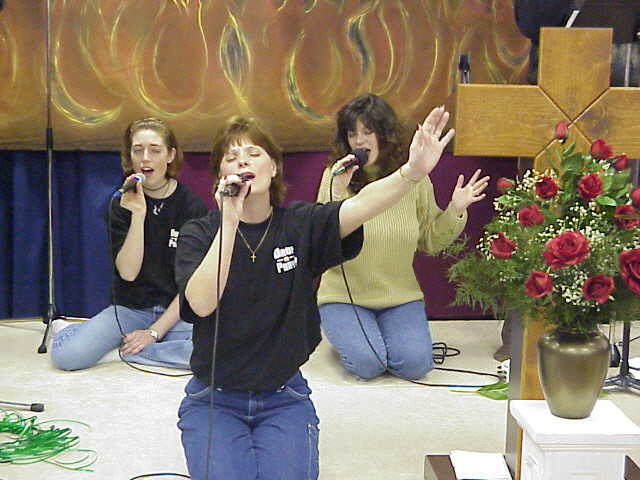 I can't say whether the young women in the photo are sincerely worshipping God, or merely acting the part for the audience. But knowing my own human weaknesses and how easy it is for me to put on a show instead of the real thing, I fear that we are teaching people that worship is form and not substance, appearance and not heart. That's a very dangerous error. Thanks, Charlie ... well said.. That was my own initial reaction based on personal experience, both as an observer and as a "performer." I'm not sure it's for us to make a judgment call about what is going on in the hearts of other people or how the Spirit is moving. If we were able to do nothing more than view the publican and the pharisee praying in the temple, it would be impossible for us to know which one Jesus praised for his faithfulness. The attitude of he heart is what Jesus praised and a picture cannot reveal this. Fred Rogers (of "Mister Rogers' Neighborhood" fame) was in seminary when he and some friends decided to drive a long way to hear a highly regarded pastor preach. But on arriving at the church, they found he had taken a vacation and a sub would be preaching. This would be bad enough, but to Rogers the sub was unbearable, preaching a bland message in a monotone. Rogers was so angry at driving so far for banalities that he was going to make a snide remark to the friend sitting next to him only to find her in tears. She confessed that the message was exactly what she needed to hear. It was at that point that Rogers decided that it was never possible for him to fully know if a message was truly without worth. This was galvanized over the years when he would get a letter from a viewer telling how one episode of Rogers's show had touched his/her heart in a special way. Often, the writer would relate something that was said during the episode, but when Rogers attempted to corroborate what was said in the script of that episode against what the viewer thought was said, more often than not there was no match. Rogers concluded that the Holy Spirit said what He wanted to say to that person through the show, even if it was not said explicitly. In other words, sometimes you just don't know how the Spirit is working. I like that they are modestly dressed and that their eyes are closed. They do not seem to be focusing on the "audience." Our own worship leader often leads with his eyes closed and knowing his heart, I know it is not a performance. I have seen some women on a worship platform that were definately not modestly dressed. It distracted me, a woman, I can only imagine and cringe at how their attire may have distracted the men in the congregation. I see in this picture a sense of reverence and that is often missing in the upbeat, "Spirit filled" worship that is so popular these days. But I agree, sometimes you just don't know how the Spirit is working. I have a problem, not just with this picture, but with the modern, western idea of limiting worship to just music, singing and praise celebrations. It's the symptom of a much larger issue we have, I believe. Hay guys it is the old pagan again. Evangelicals are a branch off of the vine of The Reformation. Although Protestant Christianity prides itself (for the most part) with their separation from Rome and Her trappings this separation inflected a blindness upon Protestants. We rightly distance ourselves from such acts of worship and prayer that exchange Yahweh’s glory for creation’s glory. However this created a relationship between us and our God that does not reflect the wholeness of ourselves given over to Him. Where am I going here? This subject is overwhelming so I will try to confine it to worshiping with our whole body and that to the fullness of our senses; sight, taste, hearing, smell, and touch I think that is right. This picture depicts interesting icon focuses. Fire in the background Holy Spirit. A cross in the foreground,our sacrifice, with roses Jesus, and a towel alongside His servanthood. The women are prostrate the position of any servant before their King. Practicing Eastern worship forms and Occult activities that I interrupt as worship but to the Demons instead of the true God - Yahweh; Father, Jesus, and the Holy Spirit I used all five of the interactive aspects that make up the fullness of my ability to understand and respond from that understanding. The Temple both on Earth and seen by John in Heaven filled the worshipper with the overwhelming presence of Yahweh. There before ones eyes could be seen depictions of the nature of the Trinity the Showbread - Jesus the Bread of life, the candle sticks representing the flame of the Holy Spirit and the Father’s protection as the pillar of fire in the wilderness. There is the Great Sea where the Priests washed themselves before presenting the lamb of sacrifice - representing the Lamb of Yahweh,both aspects of Jesus as Lamb and Priest, space limits carrying on. Read the sections in Lev.1-6 and 23-24 and the worship scenes in Rev. and Ezk. Notice sights, sounds, smells, actions, works of art representing aspects of the Godhead. Much of the reaction stemming out of the Reformation handicapped us as worshipers. How often do we use our legs. Are we in danger of being called out like David for expressing his joy over the returning of the Ark. Those of you who are daring find a Tazae (not sure of the spelling) service near you go to a Mass, go to a Synagogue experience interaction on different levels of your whole body. This is part of the exploration I had to struggle through upon becoming a “Christian” in the western setting. Unity - restoration - reformation - transformation; from what to what remember what the prefix “RE” means?! Maybe we as worshipers could open our eyes if we had something to meditate upon that depicted an aspect of the nature of Yahweh instead of having to shut off a part of who we are? What is in the picture look again do you see depictions of Christ? I feel mixed about this picture. I feel somewhat distrubed because it seems as if their interaction with God is totally on an individual bases. Their eyes are closed, they are not facing each other, they have their own mics. And yet I used to be this way and still know others that show their emotions through worship in this way. Its as if they want to touch God and feel him all around, yet isn't he all around in the people we are around? I remember the first time I was singing in a group and we all turned to face each other, eyes open. At first it was weird, but yet there seemed to be a connectedness there in each other as we sang. I can't say if these ladies are "putting on a show" or not. I hope they aren't. I just know that we have somewhat lost the communality idea of the gospel and replaced it with our individualistic tones. As a musician, playing with different tribes, I've come to experience a variety of methods of worship. Yes, we somehow get wrapped up in the "packaging/presentation" of worship; what it looks like, what is sounds like. I like my friend Benjy's comment in that music is the medium used for worship. Probably because music is found throughout the bible. I was playing at a Third Day worship celebration and there was some talk of even putting the band/worship team in another room and piping it into the congregation. As silly as it seems, the thought may force one to find another way to "get in" instead of relying on the performance of the band; what I call "worshipping the worship". Being a musician, the best worship times I have are with some beginner guitar player who knows 3 chords, leading some songs. This way I am not distracted by the musicianship of the band. Try visiting a Church of Christ. No instruments. Hee hee. I think the first part of Romans 12, sums up what worship is. So what I do find disturbing is...how an image might stir us enough to pass judgement. I can not see through the picture into the hearts and lives of these young ladies. So, I'll leave any voice to the one who can. I believe things are changing in the postmodern church...from worship being seen as stage act, to worship being an act of everyday life. I pray his Spirit will move us deeper into that reality. I think that a photo is not a fair way to judge a worship service or the hearts of the worshippers. We have no context for the photo, no idea of how people are responding, and no reason to impugn these three women for all that is wrong with staged spectator-type worship experiences. I think there is much wrong with contemporary worship, as there has been through the ages in all types of worship--since we are all imperfect sinners. if i shut my eyes and worship, then i won't be looking at what the people on stage are doing. so then it doesn't matter, cause i'm not thinking about them. it's hard to win. if you do what's in this picture you get criticized. if you don't, you get criticized for other reasons. how are we supposed to lead anyway? I see essentially a totally self-indulgent spirit in this picture. As a preacher and musician, I search for an expression that allows me to communicate the grace and justice of Jesus -- not something that encourages a focus on self. So, while I must not judge what the singers are experience, my sense is that it isn't what happens when U2 sing "40" or "Beautiful Day" or "Vertigo," right?